Since the referendum, Iraqi forces have taken over strategic locations that were under Kurdish control. The leader of Iraq's semi-autonomous Kurdistan region is stepping down after a failed push for independence. Massoud Barzani made the announcement Sunday, just days before his prolonged time in office was scheduled to end. Barzani was first elected as president in 2005, then again in 2009. His term was extended by two years in 2013 in response to the rise of ISIS, but he stayed in power even after the extension ran out. 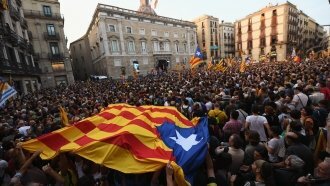 Related Story What Happens Now That Catalonia Declared Independence? Barzani's government held an independence referendum in late September, prompting a military response from Baghdad. Iraqi forces took control of strategic locations in the Kurdish region, including an air base and the oil-rich area around the city of Kirkuk. Iraq's 2005 constitution gave the Kurds some autonomy. Iraqi Kurds expanded their territory in 2014 after the federal military collapsed following confrontations with ISIS. Iraqi Kurds voted overwhelmingly for independence, but the referendum didn't get much traction internationally. The U.S. and U.K. didn't support the vote amid fears it would embolden Kurdish populations in neighboring countries to push for similar separatist movements. Both Iran and Turkey conducted military exercises along their borders with the Kurdish region in response to the vote. It's not clear who will take Barzani's place after he asked his powers be dissolved. Elections were scheduled for Nov. 1 but were suspended after the loss of Kirkuk.